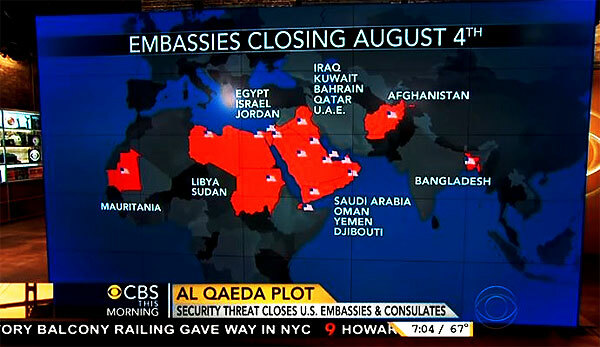 WASHINGTON (CBSDC/AP) — U.S. intelligence officials are dealing with the most credible terrorist threat in years as 19 diplomatic posts in the Middle East and Africa remain closed through this upcoming Saturday. CBS News reports that a large-scale attack may be imminent as al-Qaeda terrorists in the Arabian Peninsula already have their orders and could be in place for execution of the alleged plot. Juan Zarate, a CBS News security analyst, says this recent plot is similar to one from 2010 in which several European sites were targeted. Diplomatic facilities will remain closed through Saturday in Egypt, Jordan, Libya, Saudi Arabia and Kuwait, among other countries. In recent days, U.S. officials have said they have received significant and detailed intelligence suggesting a possible attack, with some clues pointing to the al-Qaeda terror network. The State Department said the potential for terrorism was particularly acute in the Middle East and North Africa, with a possible attack occurring on or coming from the Arabian Peninsula. “The threat was specific as to how enormous it was going to be and also that certain dates were given,” Rep. Pete King, R-N.Y., who chairs a House panel on counterterrorism and intelligence, told ABC on Sunday. King said he believes al-Qaeda “is in many ways stronger than it was before 9/11 because it has mutated and it’s spread in dramatically different locations.” The terror network’s Yemen branch, known as al-Qaeda in the Arabian Peninsula, “is the most deadly of all the al-Qaeda affiliates,” King said. Zarate, the former Deputy National Security Adviser to President George W. Bush, concurred with King’s assessment. Zarate also warned of the resurfacing of Ibrahim Hassan al-Asiri, the terror group’s top bomb maker, who was thought to have been killed in a drone strike last year. ‹ Is this monster sinkhole in Kansas still sinking?